In addition, enclosed print heads decouple print speed from the pressure within the paste allowing for better control during the print operation. With conventional metal blade printing, only two print parameters can typically be controlled: squeegee speed and squeegee pressure. The speed cannot be set so high that the paste does not roll as it moves across the stencil or too low so the print cycle time does not keep up with the manufacturing line. The squeegee pressure is usually set so that no paste remains on behind the stencil after a print stroke. Too high a pressure will damage the stencil by either coining the edges of the image or breaking the fine webs between small pitch apertures. Too low a pressure will cause insufficient paste transfer. In an enclosed pump head, such as the original MPM Rheopump, and current EnclosedFlow system solder paste is fully contained and consequently not exposed to environmental conditions that typically shorten the life of the paste. This becomes very important when working with expensive paste such as type IV or V. In addition to cost saving by extending paste life, the enclosed pump head also provides enhanced printing capability. A fundamental difference between squeegee and enclosed printing resides in the fact that in squeegee printing, the pressure driving the paste in the aperture is a function of squeegee speed and downward pressure applied to the squeegee. 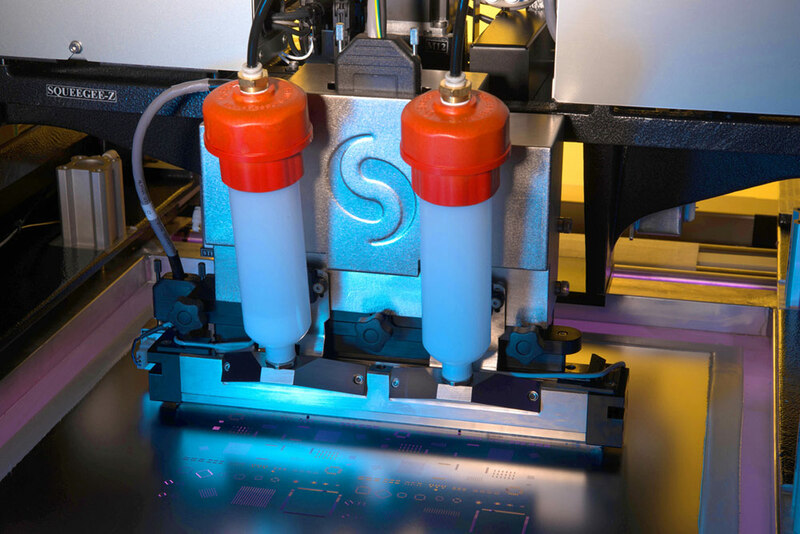 In the enclosed print head, the same pressure is decoupled from the print speed allowing better control of the printing process. Given these facts many have enjoyed better, more consistent paste transfer with an enclosed pump head. The MPM Enclosed Flow Print Head delivers uniform aperture filling and superb printing performance especially for fine pitch devices, with tremendous savings on solder paste over squeegee blade printing – in excess of 50% over blades for dramatically fast ROI. Fine features such as 01005s and 0.3mm pitch CSPs has been demonstrated to be printed with up to 50% greater volume and 25% lower deviation than metal blades.